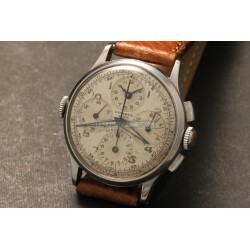 Search "Universal Geneve Aero-Compax" 3 results have been found. 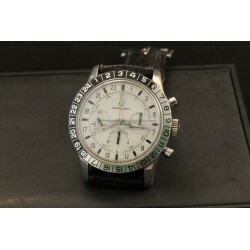 Steel case ( diameter 41mm ) Hand winding movement caliber 178 Black leather strap White dial With chronograph 24 hours dial Plexi glass Reference 890100/01 Made in the '60s Very rare model! Very nice conditions! 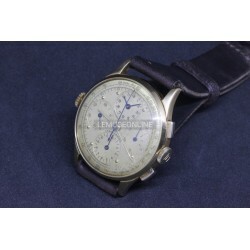 -18kt yellow gold case ( diameter 37mm )-Hand winding movement caliber 287-Brown leather strap-Original dial lightly damaged on the right side-With chronograph-Plexi glass-Reference 12540-Made in 1943-Very rare model!-Published on the Sala Universal Geneve book at page 306!